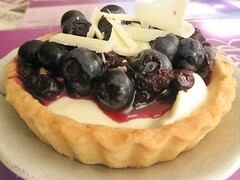 Blueberry-White Chocolate Mousse Tart - Do You Know The Muffin Man? Notes: A delicious, well-balanced tart that is fairly simple to make. I thought the use of lemon juice in the mousse was odd, but it makes the filling a little tangy and not overly sweet. The blueberry topping was really runny, perhaps some cornstarch would have helped, or further reducing the syrup. I didn't use the crust recipe as I had some leftover sweet tart dough in the freezer. This recipe yielded 11 4" tarts for me.